Belarusian analysts discuss the country's drift towards Russia, recent public opinion polls and which human rights are more important - social or political. New reports were published on the state of media in Belarus and environment for NGO activities. Belarusian analysts discuss the country's drift towards Russia, recent public opinion polls and which human rights are more important – social or political. New reports were published on the state of media in Belarus and environment for NGO activities. Who Is Losing Belarus? – Grigory Ioffe responds to Zbigniew Brzezinski's thesis that “with the decline of America’s global preeminence, weaker countries will be more susceptible to the assertive influence of major regional powers". Ioffe thinks that Russia is winning the tug of war for Belarus due to its businesslike Belarus policy. This is why, and not because of the decline in the overall America’s power, Belarus is on the “geopolitically endangered species” list. Zbigniew Brzezinski, Former National Security Adviser of the United States and the author of the concept of NATO expansion to the East, included Belarus into a list of eight geopolitically endangered countries in the event of slower foreign policy activity of the United States. Book presentation: "Europe – the choice of free Belarusians". On January 26, in Minsk, the office of the Movement "For Freedom" presented a book with the participation of the authors: Andrey Yahorau, Eduard Melnikau, Sergey Alfer, Dina Shevtsova, and others. The book consists of road maps for rapprochement Belarus and the EU in selected thematic areas: media; government cooperation with civil society; local government; freedom of conscience and religion; culture, etc. What Eurasian integration holds for Belarus – Yauheni Preiherman analyzes the prospects of the new phase of the post-Soviet integration. The expert thinks that the Eurasian integration process alone does not make Belarus’ dependence on Russia total and inescapable. At the same Belarus’ dependence on Russia is gradually growing stronger, which directly constrains any space for Belarus' geopolitical maneuvering. BISS December 2011 Polling Memo – Belarusian Institute of Strategic Studies presented the fourth issue of the polling memorandum series based on the public opinion poll data of the Independent Institute for Social, Economic and Political Studies (IISEPS). In particular, the authors consider that December’s polling results support the trend of the year – the formation of a new majority of Belarusians politically staying "in the middle", being represented neither by the incumbent, nor by the opposition. Reform, but not radical – Vadim Gigin, the editor of the state-owned magazine "Belaruskaya Dumka" comments on Lukashenka's statement about the intention to modernize the political system. Political scientist says that modernization means no revolution and its purpose is to overcome the political split in society and creating conditions for national consolidation. Gigin notes that the split is along the line of the civil majority (dominant) and the political opposition (underground). Violations of Journalists' and Mass Media Rights in 2011. The Belarusian Association of Journalists has released an annual review . In particular, BAJ identifies the following blatant violations: criminal prosecution of journalists; numerous detentions of journalists at protest actions throughout 2011; the introduction of claims against “Narodnaya Vola” and “Nasha Niva” by the Ministry of Information; restrictions on the free use of the internet, etc. Monitoring of the legal environment for NGOs-2011. The Assembly of democratic NGOs and Legal Transformation Center released a full text of a monitoring of the NGOs’ legal status and freedom of association in Belarus in 2011. The authors name the following significant events and trends: the change in legislation, enacting new restrictions on the financing of NGOs and political parties; the verdict against the Head of the Human Rights Center "Viasna" Ales Byalyatski; the prosecutor's warnings under Article 193-1, etc. Non-governmental organizations in exile: the Belarusian phenomenon – political analyst Yury Chavusau draws attention to the fact that not all NGOs wishing to obtain legal status can be registered in Belarus. In these circumstances, many of them get legal status in neighboring countries. Considering Ales Byalyatski’s case, the expert recommends to register an official legal entity abroad for donations and grants that may be an important tool to prevent allegations of tax violations. Tonkacheva and Gigin on the transformation of the political system – on January 24, on the air of TV-TUT.BY a human rights activist Elena Tonkacheva and chief editor of "Belarusian Thought" Vadim Gigin, discussed the situation of human rights in Belarus. According to Tonkacheva, the critical areas are civil and political rights, while for Gigin economic rights were more important. Vadim Gigin emphasized that Belarusian authorities did not close down any media last year and that Belarusian human rights activists work only with certain groups of population rather with all segments of the society because thematic directions are given to them by donors. Election-2012. Possible scenarios – activist of the Movement “For Freedom” Yuras Hubarevich describes three scenarios for the possible participation of the opposition in parliamentary elections in September: active boycott, participation with demands to authorities, and participation to the end. The politician does not give any solutions as to which scenario is the best. According to the State Statistics Committee Belstat, between January and October 2011 the average monthly salary in Belarus was roughly USD 208. After the second devaluation it even fell to USD 135 per month at some point. USD 200 is not a lot and it means that the economic situation of many families drastically deteriorated in 2011. Just before the presidential elections the average monthly salary was over USD 530, according to Belsat. But Belarusians still manage to survive. Living in Minsk is as expensive as it is in any city in the West – let’s say Germany – and some things are even more expensive. This is true not only for imported goods like canned vegetables, sweets, and fashionable clothing, but also for flats and even things manufactured in Belarus. For example, a pair of Belarusian shoes costs around USD 120 and a kilo of capsicum peppers USD 4.70. Prices for goods such as milk (USD 0.70 per liter) and bread (USD 0.50 per loaf) and some other "essential products" are regulated by the state, so they remain cheap. Public transportation in Belarus is also very cheap – an underground ride will cost you around USD 0.20. But most other things are disproportionately expensive compared to salaries. Job advertisements hanging in the metro and on the entrance doors of shops say they are looking for janitors, shop assistants or checkout operators, promising salaries of between USD 150-220. This is not even regarded as a low salary in Belarus. University lecturers working full time earn less than shop assistants: around USD 197 per month. The pension of a retired university teacher is around USD 130 per month. Because of low pensions, many people continue to work after they have reached the retirement age (60 for men, 55 for women). The pension of a retired army officer and veteran of the Afghanistan war is now around USD 315. Former military personnel and war veterans have long had the highest pensions in Belarus. For a Western observer, it has always been stunning that in Belarus, those people who have the most responsible jobs in society are badly paid: doctors and teachers earn ridiculously little. It is de facto impossible to live only on a Belarusian pension in Minsk and even in the countryside. This means that older people cannot survive without the support of their children. However, for the young generation, these are hard times as well. This is especially true for those working in the state service (and in Belarus, even some TV journalists are employed by the state). A customs officer, for example, earns USD 265 per month. You cannot even afford to rent a flat with this kind of income. A one bedroom flat rent on the outskirts of Minsk costs around USD 220, so young people cannot move out and have their own place. They continue to live at home with their parents and try to make ends meet. Many young families have to give up living on their own and move back in with their parents. Strangely enough, you would not think that the situation is as described when walking around Minsk. Young people wear expensive clothes and shoes, and a large number of them have smartphones. So, how do they manage? First of all, people in Belarus mainly own their flats. After the break up of the Soviet Union, many of the formerly state-owned flats were "privatized". They could buy them for a symbolic sum in the 1990s. So, most people do not pay rent; they only have to pay for communal services. Those are subsidized by the state, so it is not a very big sum (around USD 30 for a family of five). 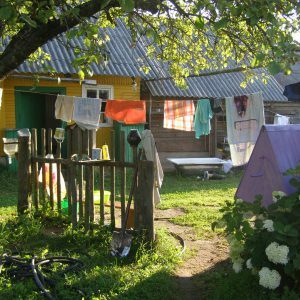 Most people also have summer houses (“dachas”) in the countryside where they like to spend the summer months. Here, they can grow everything they need during the winter: potatoes, cabbage, cucumbers and pumpkins. Potato remains a huge portion of the average Belarusians' diet – Belarus has one the world's highest per capita potato consumption rates. Some also like to collect berries and mushrooms in the forests, and pick apples and pears. They then cook jams, marinate cucumbers, cabbage, mushrooms and everything else. They usually store a significant supply of potatoes, and sometimes beets and pumpkins. They also freeze berries and beans. Many people refrain from buying fresh vegetables or fruits in winter because they are expensive. Moreover, some Belarusians firmly believe that there are a lot of vitamins in jam so they feel that they do not miss out by not buying expensive imported fruits. While it is fashionable in the West to grow 'organic' food in your own garden, it is a necessity for many in Belarus. People work hard because they know that they will not be able to afford to buy groceries in winter. Instead of going on holiday or relaxing at the weekend, they go to “the village” where they work from dusk till dawn in their gardens. So, most people own their flats and they grow food themselves. To afford clothes or electronic devices or even a trip to visit their emigrated children in the West, they have to take out a loan. And many people in Belarus do so. It is possible to buy nearly anything you want in installments: kitchens, cars, school uniforms. So, many people accumulate debts while their real income is decreasing. A lot changed in 2011, the year of the big crisis. Even families that used to be relatively well-off have become poor. If people are not starving it is because they have got used to looking after themselves. During Soviet times and during the 1990s the economic crises were even worse than now. Belarusians are wise enough not to rely on anybody but themselves and their own soil and families for their survival. But Minsk still looks well-maintained, full of expensive foreign cars and has plenty of good restaurants. Where Belarus's wealthy get their money is a topic for another article. It will be interesting to see how the country develops as the more consumption-oriented generation grows up. It might be that they will not deal with a crisis in the same matter-of-fact way as their parents do. Instead of going to the dacha to grow vegetables, they may start to protest the economic mismanagement that deprives them of the luxury they certainly deserve for their daily hard work.